According to this breakdown, it's pretty simple: kale eaters are liberal, and bacon eaters are definitely not. According to a recent article in Businessweek, the partisan politics of this nation can perhaps be best represented by an equally strong divide in food tastes. The two main foods are, not surprisingly, kale (the hipster’s superfood) and bacon (a staple food that all should cherish). 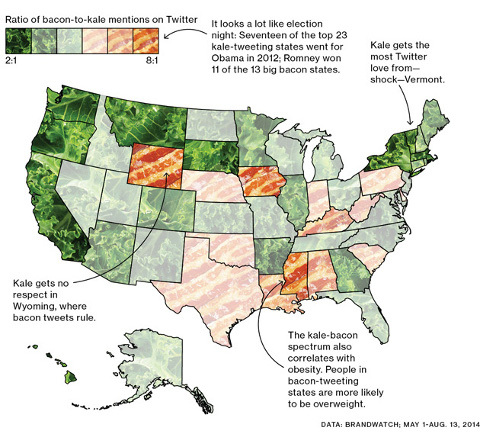 The map below shows a breakdown of the ratio of bacon-to-kale mentions in Twitter discussions, and it all points to one apparent fact when seen side by side with the 2012 election night map. The stronger the focus on kale the state had in its tweets, the more likely it was to have liberal leanings. Similarly, a higher focus on bacon was tied to conservative states. Note that 17 of the top 23 kale states voted for Barack Obama in the 2012 election, while 11 of the top 13 bacon states voted for Mitt Romney. But the representation doesn’t stop there. This kale and bacon map can also be used as a tool in understanding the nation’s obesity rates. In 2012, a higher prevalence of adult obesity was found in the south (29.4%) and midwest (29.5%), regions that are both largely conservative and, well, bacon-centric.